Cochranella granulosa is a beautiful species with grey-gold eyes and a dark green, granular dorsal surface gives the frog a “crystal-like” appearance. This arboreal species can be found in humid lowlands and mountainous forest. They are usually spotted in bushes and trees along forest streams. 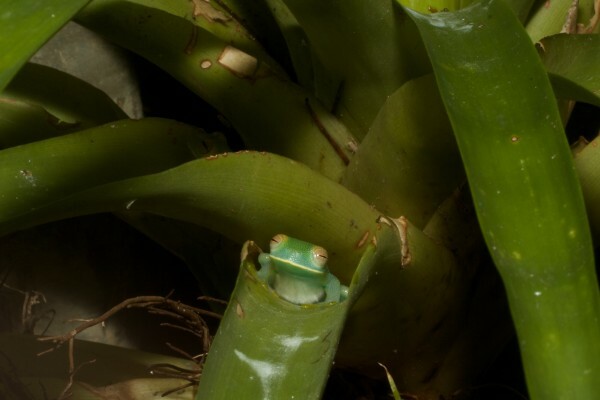 Though the granular glass frog ranges from Honduras to Panama, it is more regularly encountered in Costa Rica and Panama, while sightings are rarely recorded in Honduras and Nicaragua. 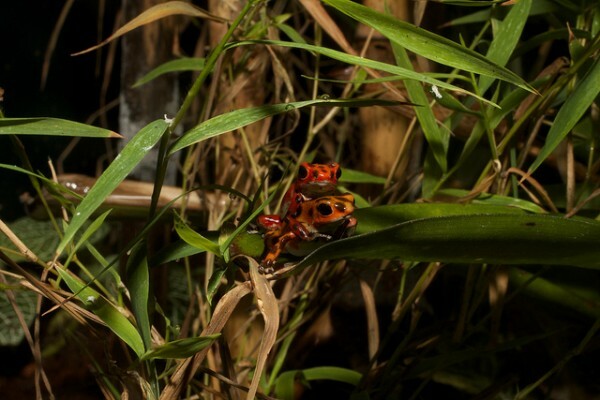 These nocturnal frogs can also be found sleeping on the leaves of bromeliads during the day in the exhibit Fabulous Frogs of Panama at Punta Culebra Nature Center. 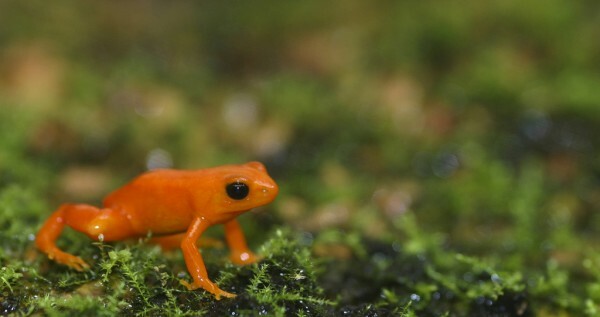 Though the frog is listed as Least Concern on the IUCN Redlist due to its wide distribution, it still faces threats of severe habitat loss resulting from deforestation and water pollution. Did you know? The word granulosa is derived from the Latin word granulum, which means small-grained or granular. This reference was drawn due to the granular bumps on the frog’s transparent skin. If you look at the frog from its underbelly, you can see right through its skin and get a great glimpse of its tiny organs! White-spotted slimy salamanders are large, attractive, boldly marked lungless salamanders from the Appalachian region of the United States. 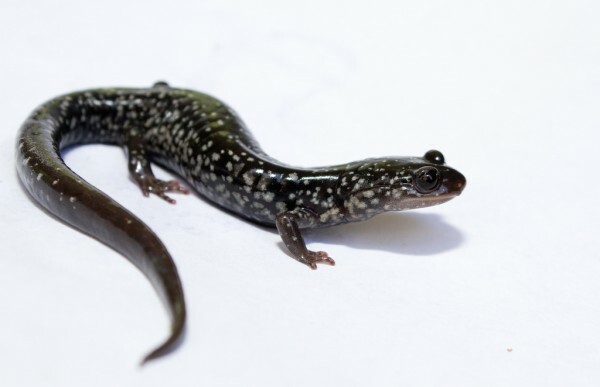 they range from Maryland to South Carolina and have a thick tail and secrete a sticky white substance when handled, giving them the group the reputation of being ‘slimy’ salamanders. These terrestrial salamanders are found under large rotting logs. They have an elaborate courtship dance where the male deposits a spermatophore on the ground that is then taken up by the female, the female lays her fertilized eggs in underground cavities where she guards them. Some authors have noted worrying declines of this species, but they are still widely distributed and can be abundant in places. They are listed as ‘least concern’ by the IUCN. Find out more about the National Zoo’s salamander conservation program here. 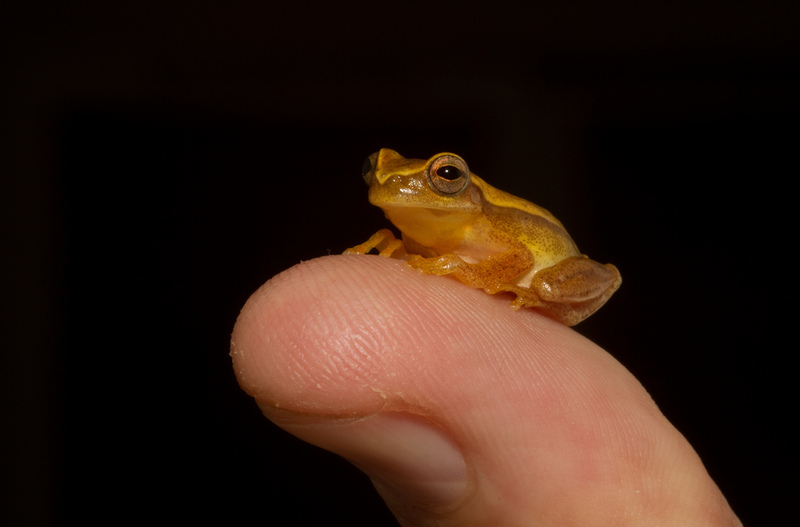 Yellow treefrogs are abundant and widely distributed in lowlands from Belize to South America. This adaptable species prefers highly disturbed agricultural areas flooded grasslands and ponds and is classified by the IUCN as least concern because their populations seem to be stable or increasing in places. Now that the rains have set in, it is tough to find a freshwater ditch or puddle in Panama that does not have the tell-tail ‘cuieeeeeee-chuck’ calls of male túngara frogs hoping to attract a mate. 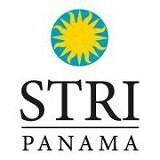 If you live in Panama, follow this distinctive call to its source and you are likely to find an otherwise unremarkable, warty little creature putting on the performance of his life. This tiny brown comedian turns his whole body into an inflatable pool-toy on the water, exuding air from his swollen body into a huge gular pouch and back again. 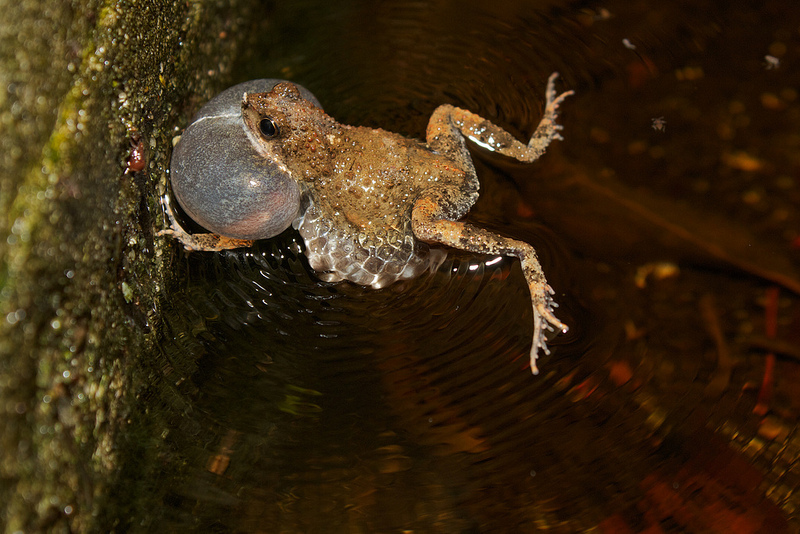 Frogs that can avoid the attention of voracious frog-eating bats drawn to their calls pair with females and whip up the egg mass into a stiff white foam nest, using their hind legs like egg-beaters. The foam protects developing embryos from dehydration, sunlight and pathogens until they hatch after around 4 days. Check out this video about Smithsonian Tropical Research Institute Scientist Rachel Page, who studies these little creatures and the bats that snack on them. 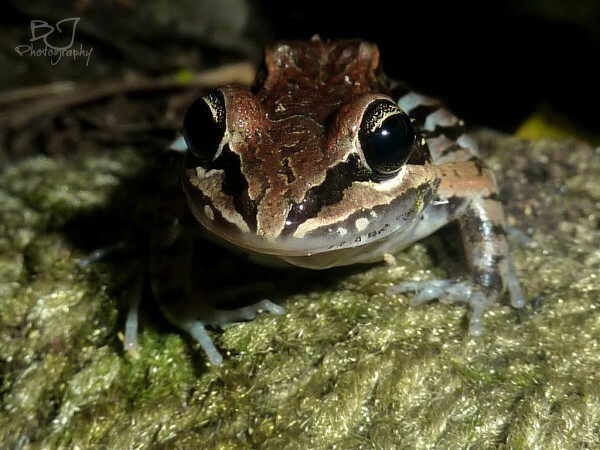 Tungara frogs are thankfully still thriving in the wild and are listed by the IUCN as least concern. Photo courtesy of Brian Gratwicke. 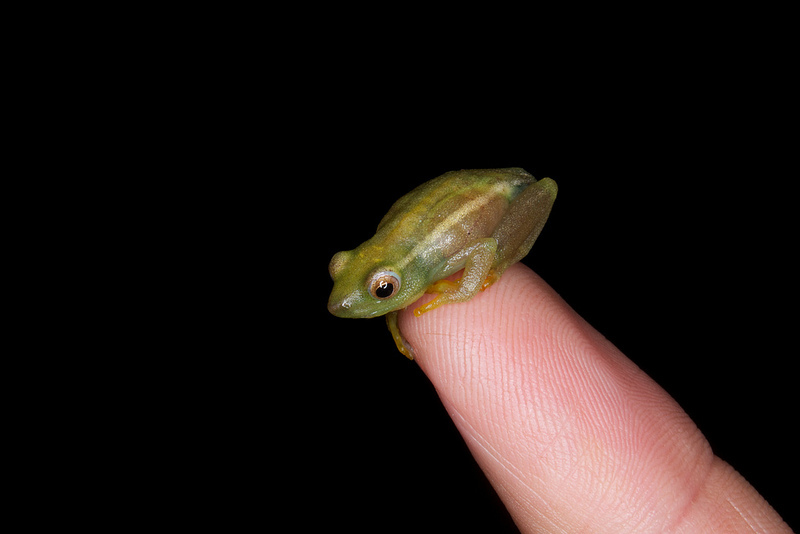 Send us your own cute frogs by uploading your photos on flickr here. 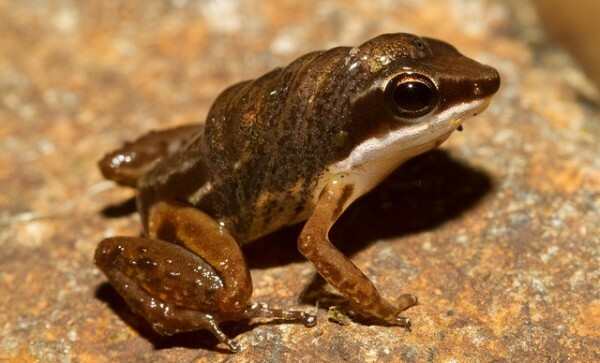 The white- lipped frog is a semi-aquatic frog found in streams, marshes, irrigated fields and gutters. It is native to the Dominican Republic, Puerto Rico and U.S. and British Virgin Islands. Due to its appearance in Spanish speaking areas, the frog is better known by its local Spanish name, Ranita De Labio Blanco. The frog’s name derives from its distinctive white upper lip, while the remainder of the skin typically includes shades of greenish-yellow, green, brown and black with varying spots and stripes. It has a medium size body with long limbs and un-webbed toes. While this species is currently wide spread in the U.S. Virgin Islands, it seems to be declining in the British Virgin Islands. In total, this species is fairly common and adaptable to different environmental changes. 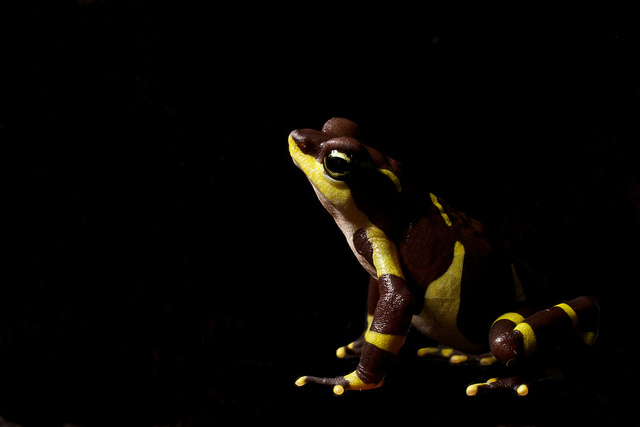 Due to these factors, the IUCN has listed the white-lipped frog as Least Concern on the Red List of Threatened Species.